Single bowl granite topmount sink. Includes integrated accessory ledge on sink rim, one stainless steel bottom grid to protect sink bowl, and waste fitting. Kindred Granite sinks feature smooth Durakleen finish to ensure ease of cleaning, and a patented Sanitized Silver<sup></sup> compound for added hygiene even between cleanings. Hand fabricated single bowl stainless steel undermount sink. 10 mm radius corners and commercial satin finish afford ease of cleaning. Rear placed drain means more storage below the sink. Sink bowl is pitched to center of the waste hole to ensure efficient draining. Undermount template and waste fittings are included right in the sink packaging! Single bowl hand fabricated 20 gauge apron front sink with curved apron. Sink may be installed above, below, or flush with counter. Bowl sloped to center of the waste hole, and drain lines for efficient draining. Rear drain position for more storage below the counter. Commercial satin finish is a lovely complement to commercial look appliances, and is easy to maintain. Double bol granit encastri ivier. Comprend corniche accessoires intigri sur ivier jante, un acier inoxydable grille de fond pour protiger ivier et raccords d'ivacuation . Iviers de granit Kindred disposent finition Durakleen lisse pour assurer une faciliti de nettoyage, et un composi Sanitized Silver<sup></sup> brevetie pour l'hygihne ajouti encore entre les nettoyages . Single sink Espresso Single bowl granite topmount sink. 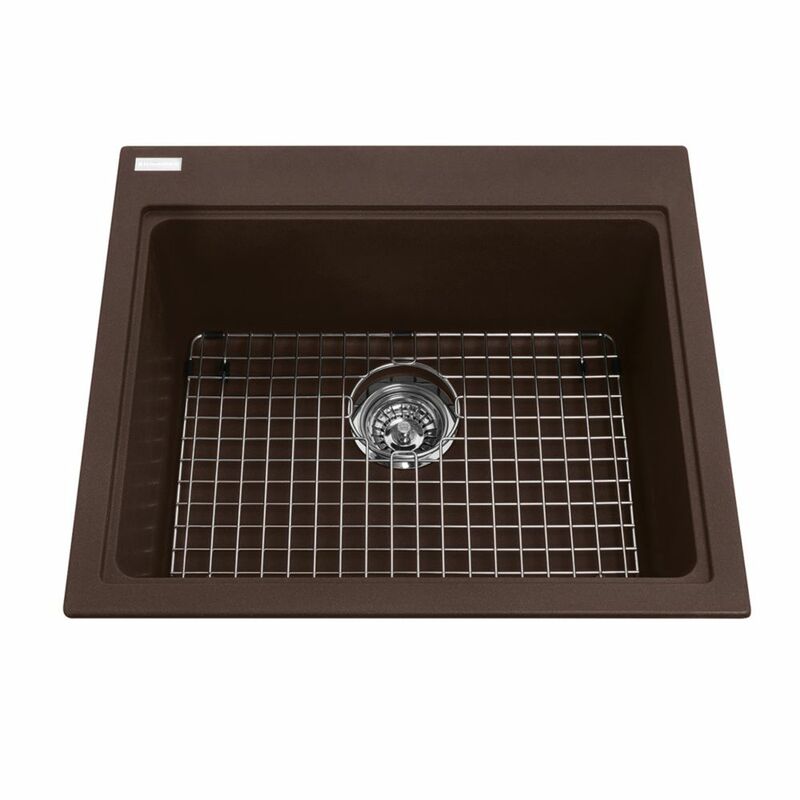 Includes integrated accessory ledge on sink rim, one stainless steel bottom grid to protect sink bowl, and waste fitting. Kindred Granite sinks feature smooth Durakleen finish to ensure ease of cleaning, and a patented Sanitized Silver<sup></sup> compound for added hygiene even between cleanings.